1. Personal and non-personal information. We understand the importance of our users’ personal information, and more importantly the information pertaining to children under 13 years of age. We do not collect or require users to enter their personal information when using our applications. We do not collect any personal information from children with our applications. When using our applications, we might read non-personal information (such as internet, Wi-Fi availability, network connection, wake lock, device status, internal and external storage availability and usability) for the use of Product development and Service improvement. The collection of information will be used for the development and functional improvement of our applications to ensure quality user experience. We only collect such information to the extent that allow us to conduct our normal business operation and applications research and development. We comply with the Children’s Online Privacy Protection Act. We do not knowingly collect personal information on children under the age of 13. When a user identifies himself or herself as a child under the age of 13 through a support request or through any feedback, we will not collect, store or use, and will delete in a secure manner, any personal information of such user. 3.Submitting personal information for prizes and customer support. 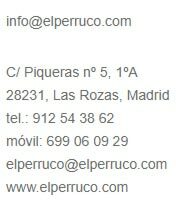 From time to time, we may host contests or surveys on our website at www.elperruco.com. We may send out a letter to your email address after you have given us consent through your participation and agree to receive the prize for the event you have participated in. For contests and surveys, we typically require only the information necessary for a child to participate. We only contact the parent for more personalized information for prize-fulfillment purposes when the child wins the contest or completes a survey. When you request support, you may send us an email or contact us on our website. We allow users to contact us if they have support questions about the use of our mobile applications. If you submit a support request, we may receive your email address and other information you provide related to your support request. 5. Third party websites and links.